There is a reason clients keep coming back to Algonquin Outfitters for their outdoor adventure experience, year after year. The key is our people, both up front and behind the scenes, that help make your experience enjoyable and safe. If you haven’t found the answer you seek elsewhere on this web site, using resources like our Canoe Trip Planning Guide, this is your chance to draw on some of their knowledge. Read through the information below, and if you can’t find the answer, feel free to send us an email or pick up the phone and call 1-800-469-4948 (1-705-635-2243). Biking: Are there mountain bike trails? Algonquin Park: The Old Railway Bike Trail is located right at our Lake of Two Rivers store where bike rentals are available. It provides an excellent experience for families and those seeking an easier ride along 10km of old railway bed. Algonquin Park: Minnesing Mountain Bike Trail provides a rugged challenge for mountain bike riders in Algonquin Park with loops from 4.7 to 23.4 km in length. Buckwallow Mountain Bike Centre, located near Gravenhurst, operates over 20km of professionally built mountain bike trails, with both single and double-track options and a range of difficulty levels. Information: 705-687-8858. Sir Sam’s Ski & Bike in Haliburton offers both cross country (10km) and downhill (7km) trails for all level of riders. You can enjoy riding the trails up and down or use the lift to transport you and your bike to the top. Camping: What about the bears? There are black bears in Algonquin Park. Most people never see one but there are simple precautions you can take. For a good overview on bears, bear behaviour and strategies for camping in areas inhabited by bears, check out the Algonquin Park bear page, the Black Bear page from The Science Behind Algonquin’s Animals and the Bear Wise Home Page. Bears are very intelligent animals and can figure out most “bear-proofing” systems. In Algonquin Park, food-hanging is probably the most popular method and has proven to be most reliable, if done properly and care is taken to reduce food odours, which is what attracts animals in the first place. Many people use so-called “barrel packs” for food storage on canoe trips. These are 60 litre industrial-grade plastic shipping containers with a custom backpack-style harness. We rent and sell these packs ($8/day to rent, about $140 for barrel & harness to purchase). Though some folks claim these are bear-proof, we guarantee they are NOT BEAR PROOF! They are maybe small critter proof, because they are air and water-tight and do a very good job of protecting food and containing odours. But I’ve actually seen a raccoon open one and as you can see from the picture to the right, bears can easily chew through them. Keep your campsite clean and free of food residue and always hang your food pack in a tree (10-13 ft off the ground and 6-7 ft out from the trunk) to ensure that wild animals like bears, raccoons and even mice don’t get into it. This question comes up a lot because people are thinking like booking hotel nights. A three-day canoe trip is best experienced over 3 days, 2 nights. As in Tues, Wed, Thurs… or any other combination of three days. All of our rental gear and packages are based on calendar days as you are most likely to use them during the day vs. a hotel room which you use during the night. On any gear rental longer than 2 days, you can pick up the night before and return at opening the morning after as an option too. Canoe trip packages include food for the first day Breakfast, Lunch and Supper while on the last day it typically just includes breakfast and a travel lunch. Our Canoe Trip Packages include all the camping gear, paddling gear (including a lightweight quality brand canoe, like Swift Canoes), food and planning needed for an Algonquin Park backcountry trip. The only extra expenses are your Ontario Parks backcountry pass and your transportation to Algonquin Outfitters and your access point in Algonquin Park. Additional options like Guide services, or special products like a bug jacket (we do provide bug repellent) are optional. Gear/Sales: Do you sell your used canoes & kayaks? One of the most searched-for items on the Algonquin Outfitters website and blogs is “Used Swift Canoes”. We typically publish our first list in late September, with updates on a regular basis. Be sure to check our Events Page. We encourage anyone looking for a used canoe to make the drive out to our Oxtongue Lake location or visit one of the Swift Road Shows and actually look, feel and even paddle a used canoe before you buy one. The best time to look for a used canoe from Algonquin Outfitters or Swift is in the fall, starting in mid-September, and again in the spring. It can be difficult to look at canoes in the winter but we are always happy to do a bit of shoveling if the canoe-buying urge strikes you. Every year we sell off a number of used rental canoes. Most have seen several seasons of rental use and will usually have scratches and patches on their hulls. All of our canoes have been reconditioned to a “no leak” condition and some may even have had new paint jobs. All are a good value. Most Kevlar models sell between $1100 and $1900 (about half to a third of their retail price) and fibreglass models sell between $600 and $900. The most popular used models are the Swift Algonquin 16 & 17 and the Swift Kipawa 16’6″. We also sell off many of our rental kayaks each year, with prices starting at 20-50% off. 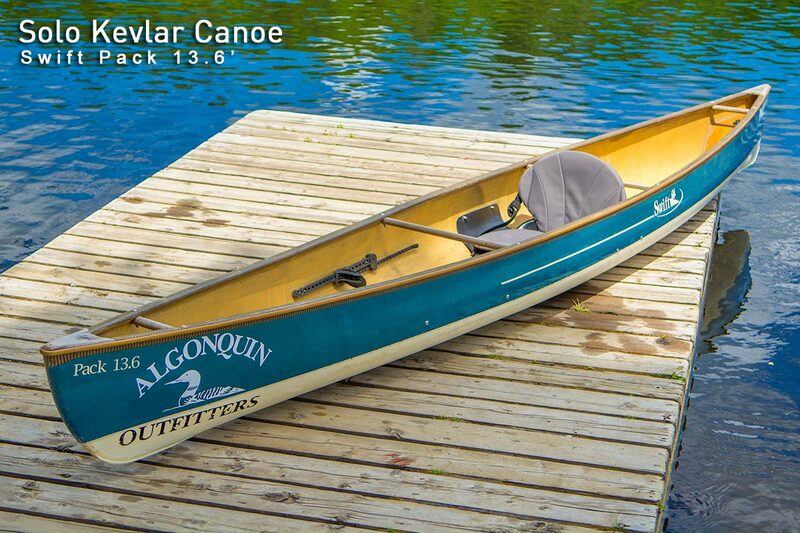 Outfitting / Rentals: Do you deliver canoes to Algonquin Park campgrounds? YES! New in the 2016 season, Algonquin Outfitters, Oxtongue Lake location, now offers deliveries to several Algonquin Park campgrounds. Ideal for customers taking the Park Bus or driving a vehicle that’s not capable of transporting a canoe, kayak or paddleboard. Why not have it delivered right to your campground? Full details, pricing, schedules and more information on our Canoe Delivery Page. For those who wish to save even more, you can pick up or paddle from the dock at our Lake Opeongo store for a special rate as a campground permit holder. Our Opeongo Store offers a discounted rental rate for roadside campground users – call them toll-free at 1-888-280-8886 and ask about the “campground special”. Portaging: What is the best way to portage a canoe? 2. anyone would be nuts to actually do this for fun! The trick to making most portages fall into the first category is planning and practice, coupled with a few basic techniques. pick a lightweight canoe, as an extra 10lbs can make a big difference when you have to carry it for 2km. pick a canoe with a comfortable yoke. All of our Kevlar rental canoes feature a deep dish yoke designed for portaging. for extra comfort, try one of our yoke pads. learn a two-person lift to get the canoe up for a one-person carry. wear supportive footwear and carry a proper fitted pack. Many people feel that portages must be done in “one trip.” To accomplish this safely requires experience, careful packing and good fitness levels. If you can handle the weight, then you will save a lot of time. Taking short breaks more often will help compensate for the extra effort. In the end, you would have to spend two-thirds of your time resting on a “one-trip” portage to take the same amount as a “two-trip” portage, provided that you don’t take a break. Most people take multiple trips on portages. There are ways to make this method more efficient, such as the “trip-and-a-half” portage. This requires at least two people and the trippers split into two groups. The first group takes their first load, goes to the halfway mark on the portage (or roughly) and sets the load down. They then return to the beginning, pick up the remainder of the gear and cross the entire portage. The second group takes their gear to the far end of the portage, then returns to the halfway point to pick up the gear that group number one dropped off. For safety, it’s a good idea to wait for each other at the mid-point then finish the portage together. Instead of all members walking the portage three times (over-back-and-over), they all walk the portage twice (once over, plus the other time made up of the two half trips). This technique is best used on longer portages. Those under a few hundred metres are not as tough to slug through in two trips. The time savings using the “trip-and-a-half” method on portages over a kilometre are substantial, plus the walk back makes for a nice break and opportunity to enjoy the forest scenery. I’d like to do an interior trip in trip in Algonquin Park using a kayak. Is this a good idea? Kayak touring is a perfect way to explore large expanses of open water with little or no portaging. Some of Algonquin Park’s larger lakes, like Lake Opeongo, Rock Lake or Galeairy, are well suited to this type of travel. While kayaks are certainly fast and fun to paddle, we generally try to discourage people from using them on trips with longer and/or many portages. Portaging kayaks is tricky and time consuming, and will use up most of the time you gain by faster paddling. A good compromise might be paddling one of our new Pack Canoes with a kayak paddle. This offers individual travel with close to the speed of kayaking but the carrying capacity and ease of portaging of a canoe. We rent Swift Pack Boats and a variety of solo canoes, including Swift solo models like the Shearwater, Keewaydin 15 and Osprey. All are 13 – 16 feet long, weigh 26 – 39 lbs and come with a detachable carrying yoke, since the seat is in the centre of the boat. Gear space varies with the model. They all tend to be narrower than tandem canoes. We often recommend the Shearwater for your first solo trip, since it is the most roomy and very stable. For more information on Solo Canoe or Kayak trip packages visit our Solo Trip page or Canoe Rental page. Canoe Routes: Where should I go? It is difficult to give specific route advice without knowing whether you have a park map and what previous experience you have in Algonquin Park or similar areas. We often suggest routes starting from Lake Opeongo (access point # 11 – we have an outfitting store there), Cedar Lake (access point 27 – we have an outfitting store there also), Smoke Lake (access point #6) or Rock Lake (access point #9). Our outfitting store at Oxtongue Lake is the most convenient outfitting store for the last two access points. If you would like more detailed descriptions, please call us, at 1.800.469.4948, with a map handy. We suggest making camping permit reservations before making equipment reservations. The park permit reservation system has been centralized for all provincial parks in Ontario. You can make reservation up to 5 months ahead of your trip. Reservations for Algonquin Park interior trips can be made by calling toll free: 1-888-668-7275 (outside of North America: 1-519-826-5290), or by visiting the Ontario Parks website at www.reservations.ontarioparks.com. They will want to know where you intend to camp each night of your trip. To check campsite availability in advance of making a reservation or get route advice, call the Algonquin Park information line at 1-705-633-5572. Canoeing: What to bring on a canoe trip? The answer to this popular question depends on the route, group, season and many other factors. The simple answer is to book one of our complete outfitting packages. In that scenario, all you need to bring are your personal items like clothing, toiletries and camera. On our canoe trip planning page, you can find a list of personal gear to bring on a completely outfitted canoe trip. Start with a lightweight (eg. Kevlar) canoe equipped with a comfortable yoke for portaging. tarp (10×10 is handy size). Useful as a secondary shelter in camp and for covering gear in canoe when it rains. An absolute essential in the spring and fall. This list covers the basic requirements for an Algonquin Park canoe trip. Many people choose to pack more items than what we have listed here. Keep in mind that everything you pack is extra weight to portage, so do your best to keep it light and pack just the essentials. 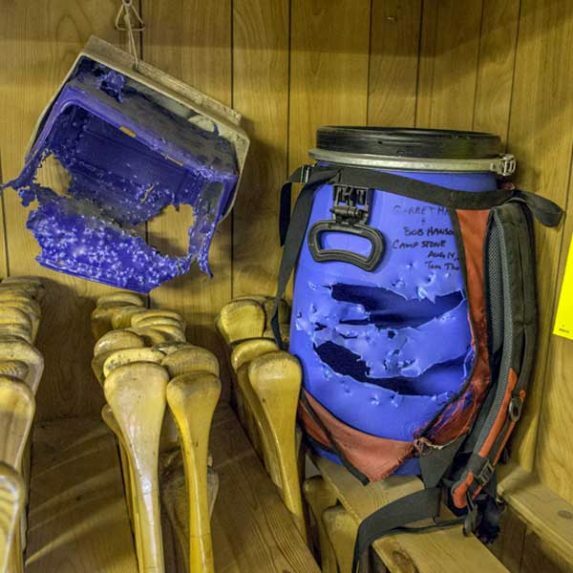 *What are barrel packs, canoe packs and dry packs? Barrel packs are plastic shipping barrels re-purposed for canoe tripping, ideal for transporting food. They are waterproof, airtight, crush-proof and somewhat critter-proof, coming in either 30L or 60L size with a backpack harness to make portages easier. Do not let anyone convince you that these barrels are “bear proof.” They are certainly highly bear-resistant, and, because they are air and water-tight, do a very good job of protecting food and containing odors. Canoe packs are the one piece of gear that is a “must have” if you are doing any portages. Shorter and wider than hiking packs, they are designed to fit easily in canoes. More heavy-duty than most hiking packs, the shorter height of a canoe pack makes it easier to carry a canoe and a pack. They are usually between 90 and 120L in size, made of water resistant material (not waterproof), and usually have adjustable shoulder harnesses, waist belts and side cinch straps. Many also have side paddle pockets to attach paddles when portaging. When using packs like this, the goal is to get all of your gear inside the pack, which will make portaging much easier. Dry packs, also known by a common brand names as “boundary packs” or “baja bags,” are completely waterproof packs that come in a wide range of sizes. The drawback to these packs is that they are generally smaller than most canoe packs, trickier to pack, less durable and not as comfortable to carry. We recommend using the smaller stuff-sack sized versions for personal clothing bags, then packing those inside a canoe pack. Learn more by joining our Community. Hiking: Where can I hike in Algonquin Park? Algonquin Park hiking trails fall in to one of two categories, either day hiking trails or backpacking trails. The Backpacking Trails Map can be ordered online from the Algonquin Park Book Store or from Algonquin Outfitters by mail order. 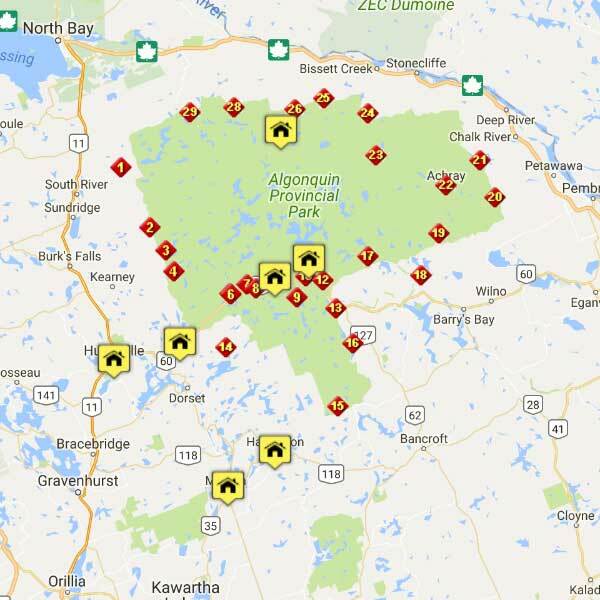 Call Algonquin Outfitters in Oxtongue Lake to order Adventure Maps, Backroad Mapbooks and Jeff’s Maps (1-800-469-4948). Nordic Skiing: Are there Nordic ski trails? Algonquin Park is a winter wonderland from December through March. With frozen lakes, snow covered ground and frosted trees, it’s one of the most beautiful and peaceful sights to be seen. A great way to get out there and enjoy winter in Algonquin Park is on cross-country skis, touring one the three Nordic ski trail systems. Outside of the park there are several more ski trail systems to explore. Algonquin Outfitters: Where can I find your store locations? Established in 1961, Algonquin Outfitters has grown to include a family of stores in the Algonquin Park, Muskoka and Haliburton Highlands regions. While the core of the business has always been Algonquin Park wilderness canoe trips, our product lines and services have grown to include mountain and road bikes, canoe, kayak, wakeboard and waterski sales, as well as winter sports equipment like snowboards, alpine and nordic skis, and snowshoes. Retail locations located in Oxtongue Lake, Huntsville, Bracebridge, Port Carling, Minden and Haliburton carry a wide variety of gear and clothing. Seasonal locations at Lake Opeongo, Lake of Two Rivers and Brent operate seasonally within Algonquin Park, offering rental and retail services for park visitors from late April through Canadian Thanksgiving. Locations at Hidden Valley Highlands Ski Area near Huntsville and Sir Sam’s ski area in Haliburton also operate in the winter months, providing demo programs for ski and snowboard as well as clothing and accessories. Each Algonquin Outfitters location has a unique personality, catering to the particular needs of that area. Every store has a retail presence and all, with the exception of Port Carling, offer outdoor equipment rentals, in varying degrees. To see a full searchable list just click the Store Locator link at the top of any page. More information about our stores, outfitting bases and the products we sell can be found online in the Store Locations pages. Seasonal/Weather: When is Algonquin Park ice out? A few seasons ago, our intrepid reporters unearthed a secret document revealing the results of a 33 year study of ice-out dates on Opeongo Lake. Opeongo is usually the last lake to open up in Algonquin Park. “Ice-out” refers to the day when boat travel from end to end is unimpeded by ice. Over 33 years of record-keeping, the average ice-out date was April 30, the earliest was April 12, 1981, and the latest, May 15, 1972. A new ice-out record was set in 2012, when Lake Opeongo became ice-free on March 29. With such a wide range of potential dates, you now know why our staff have such difficulty answering that popular question, “When will the ice go out this year?” The best strategy for trip planning is to have a flexible schedule and route plan and to phone us closer to your trip dates to get a better prediction. Would you consider either of the courses exhilarating, or are they more educationally focused. Is there a specific start time for the half day and full day courses. Wildlife: What kind of wildlife can be seen in Algonquin Park? Algonquin Park is home to many different types of animals, birds, reptiles, insects and fish. 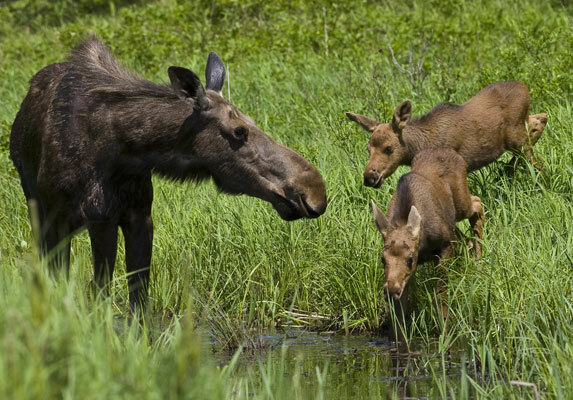 For more information on Algonquin Park’s wildlife visit The Science Behind Algonquin’s Animals website.